When I first learnt about sensory issues I was told to cut the labels out of clothes to prevent them scratching and to turn Dylan’s socks inside out to avoid the hem irritating his toes. The truth is that Dylan has never been bothered by hems or labels; this professional advice was a total waste of time, in fact if the amount of adjustments I needed to make was just snipping a few labels then life would be much more straightforward! Looking reflectively at Dylan’s journey with dressing it’s only when you try to describe a situation that you realise the huge adjustments that are made over time to allow progress. Due to a combination of his sensory needs and fine motor skill difficulties skills such as doing and undoing buttons are consistently problematic. Dylan will only do buttons up when sat down and instructed to do so with maybe one or two examples completed for him. He needs support to ensure that the buttons and holes are lined up before he starts. If he misjudges this and needs to restart the task he quickly becomes distressed and overwhelmed at the anxiety that the restarting causes. To Dylan the task was to do the buttons up, no one mentioned about lining up the correct button and holes and now he’s having to do it again???!! WHY???! The frustration at being incorrect and anxiety at having expectations being inconsistently given to him quickly escalates with him grabbing and pulling at his face, bruising himself as a punishment. To avoid issues with fasteners we often plump for over the head type t-shirts or sweatshirts, if they have a hood then that’s even better as they can provide the sensory feedback of Dylan having his head covered. Clothes are often back to front or inside out which doesn’t seem to bother Dylan. This has to be carefully pointed out and then a change around is gently suggested – rather than instructed – to avoid the aforementioned self-blame and anxiety. It’s not unusual for Dylan to come out in the 30 degree heat whilst on holiday in a thick sweatshirt or go out in the rain with a pair of crocs on. Dylan doesn’t have the ability to plan what to wear in relation to the weather. He knows to wear trunks for swimming and will often go to bed in them on holiday in case there’s a chance of a surprise dip in the pool but otherwise the comfort and environmental resilience is not relevant to Dylan when putting clothes on. There’s a wide variety of techniques we have adopted to promote independence whilst maintaining a level of decency. Dylan will often forget to dress in any order so if he puts trousers on before his underwear then he will just go without them, a quick check is necessary to ensure that all clothing is present and in correct order. Shoe laces are currently a no-no; we are working on teaching this skill but it is a complex one to remember and coordinate for. When outdoors I often have to reach down and tie Dylan’s laces for him as they have come undone, this can generate some suspicious looks from passers by. Velcro is popular choice for ease but we do need to address the lacing skills in the meantime as a longer term plan. Shoes are a clothes item that we get through a lot of, with Dylan’s skipping around he loses the tread unevenly on his shoes and they often wear bare in places. Shoe shopping has the usual pleasures for Dylan which is the same for most children; lots of waiting around, the uncomfortable measuring – usually by sales assistants who look as if they couldn’t care less about shoes or how they fit let alone the child they are attached to but maybe that’s me? 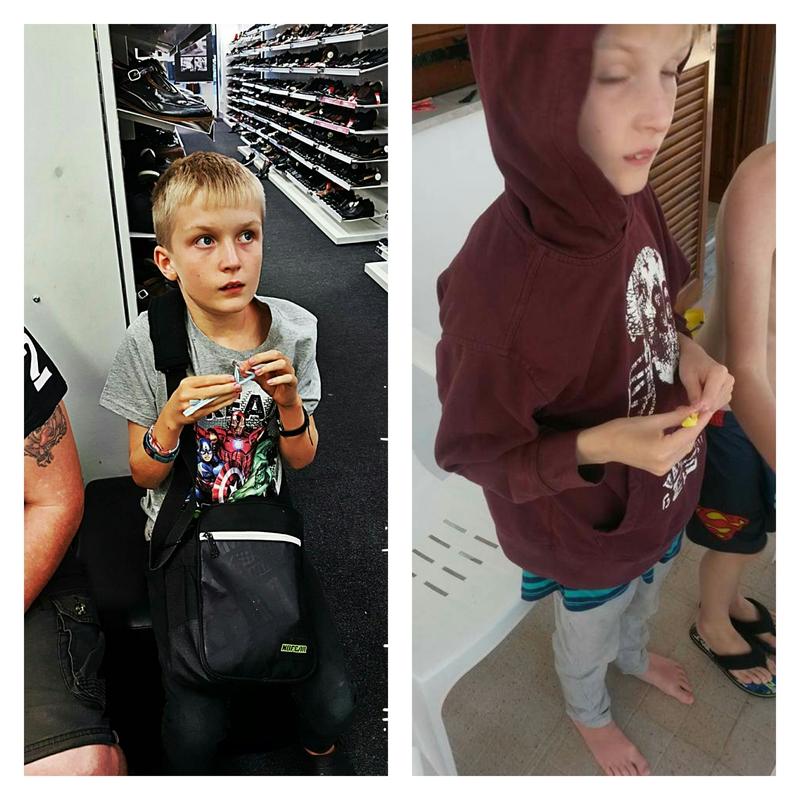 Dylan cannot communicate to let us know if his shoes are too small or uncomfortable and there are no additional methods or support tools within shoes shops to support this difficult but important transaction which allows us to have comfortable shoes. Quite often it’s a guessing game or we check Dylan’s feet regularly for pink or sore areas to try and identify any ill-fitting shoes. Looking forward, another area that we need to work on is for Dylan to be independent with clothes shopping for himself. We need to teach Dylan how to choose clothes, to develop his sense of self where he finds clothes that he likes or prefers and he would like to wear. Dylan knows that he is thirteen years old but does not easily link this to the labelling of clothes. When selecting clothes in a shop – which he will only do when asked to – he will often pick out a baby’s t shirt or younger child’s item. I don’t know if this is because of the more attractive patterns on the clothes, if it’s because they are often at the front of the rail when clothes are on display or if he is just humouring me when I ask him to select himself an item of clothing. Clothes don’t seem to be important for him at present as a fashion statement; they are merely bits of material that he has to put on before he is allowed to go out. To go out somewhere important…. Like to the shops, to buy crisps. After all eating crisps is much more motivating than getting dressed.